This post is going to attempt to correct some fallacies about caffeine. Despite all the news about how healthy caffeine actually is, there are still many who believe it’s unhealthy. Why is this? Well, we tend to learn based on first impression. Meaning, when we hear something for the first time, that belief tends to become the truth that we live and judge by. Especially when that something was stated by someone who holds authority in that particular field. When new evidence comes out stating old beliefs are indeed false, most people have a hard time truly grasping the new truth. They may claim to believe it based on the evidence presented, but subconsciously they still follow the old belief system. All that being said, many people believe caffeine is horribly bad for you because of outdated information. Many doctors still believe in, and make recommendations based on, this outdated information. Despite new information stating otherwise. So I am going to try and correct many misconceptions about caffeine in this post. But first, it must be understood that I am speaking about natural caffeine; not synthetic caffeine. What’s ironic is how an estimated 80% drink coffee. Then there’s all your tea drinkers and consumers of energy drinks and caffeinated sodas. Yet, despite all this caffeine consumption, a large part of the population will tell you how unhealthy caffeine is and put all these rules on consumption. Some even boast over the fact that they quit drinking coffee or tea because of the caffeine. Meanwhile, their health would have benefited more had they kept consumption of coffee or tea and simply quit drinking soda and energy drinks. These are great benefits of caffeine consumption, and this is only a partial list of the benefits found in various studies. However, too much of any good thing is still bad. So despite all these benefits, you don’t want to go super crazy on caffeine. And, remember, this is natural caffeine. So stay away from those sugary, highly caffeinated energy drinks and sodas. Researchers who performed a study of 201 studies on caffeine, back in 2011, conclude that the benefits of consumption far outweigh any risks. So, if you’re wanting to consume caffeine, go right ahead. Just be sure it’s a natural caffeine, such as found in coffee and tea (which have high antioxidant levels). If you follow this blog, you already know I’m going to recommend the coffee and tea be non-GMO and/or organic. To those worried about possible side effects, most side effects usually disappear after prolonged consumption. Now a little bit of detail, shall we? Did you know caffeine is a nootropic? When you consume caffeine, interesting things begin to take place. The caffeine is absorbed into your bloodstream. From there, it travels to your brain. In the brain, caffeine blocks the inhibitory neurotransmitter adenosine. When this happens, the amount of other neurotransmitters like norepinephrine and dopamine increases, leading to enhanced firing of neurons. Many studies show that coffee improves various aspects of brain function; including memory, mood, vigilance, energy levels, reaction times and mental clarity. Caffeine also stimulates your nervous system, signaling fat cells to break down body fat. Studies show it also improves your metabolic rate by 3-11%. Caffeine breaks down body fat, making free fatty acids available as fuel. Is it any wonder why caffeine is added to so many weight loss products? Those who drink coffee are also getting added nutrients contained within. Many of the nutrients in coffee beans make their way into the finished brewed coffee. These numbers may not look like much of a big deal, but most coffee drinkers consume more than one cup each day. These numbers begin to add up throughout the day with each additional cup of coffee. Caffeine is able to assist in the reduced risk of Parkinson’s Disease as the disease is caused by the death of dopamine-generating neurons. As we learned above, caffeine increases the production of dopamine. While there is no known cure for the disease, the increased production and health of the neurons may significantly reduce the risk of developing the disease; including those who have a genetic predisposition to the disease that would normally increase their chances of developing the disease. Studies show that most people in the west receive more antioxidants from coffee than from fruits and vegetables combined; effectively making coffee the healthiest part of the western diet. It is quite possible that coffee may be the healthiest beverage in the world, alongside tea. According to the European Food Safety Agency, pregnant women can consume up to 200mg of caffeine per day; and children can consume up to 3mg per 2lbs of body weight (equivalent of two cups of milky tea for the average four year old). Did you know caffeine is used to save pre-mature babies? Caffeine is routinely administered to preterm infants in the neonatal intensive care unit to coax their brains and lungs to keep breathing. Studies show this natural stimulant works by reducing “apnea,” or pauses in preemies’ breathing, and staving off intermittent drops in their blood oxygen levels. The process of creating synthetic caffeine is a chemical from start to finish. Synthetic caffeine starts with ammonia which is then converted to urea (a synthetic version of a compound found in urine), combined with chloroacetic acid to produce a compound called uracil. The uracil is processed and converted to theophylline to which is added methyl chloride to produce the final product: methylated theophylline – otherwise known as synthetic caffeine. Synthetic caffeine found in energy drinks and painkillers along with soft drinks and pre-workout formulas is produced in a lab without the accompanying phytonutrients and antioxidants, vitamins and minerals that substances such as coffee, green and black tea as well as guarana contain naturally alongside it. Although many people think decaf coffee and tea is healthier, the process used to make it is far from natural. Researchers are also currently developing genetically engineered (GMO) coffee plants with reduced caffeine levels. With all these amazing benefits, it is perfectly safe to drink your coffee or tea. So don’t worry about the negative hype and outdated claims. Studies from all over the world show the benefits far out weigh the risks or side effects, consumed moderately. Consume non-GMO or organic coffee and tea – avoid sodas, energy drinks, and other forms of synthetic caffeine – and you are improving your chances of living a longer, healthier life. Stop feeling guilty for drinking your favorite coffee or tea. We offer all non-GMO and organic teas, if you’re interested in replacing your supermarket brand and conventional teas. Click here to take a look and place an order. We also offer an amazing nootropic coffee. The coffee, and added nootropics, are non-GMO. 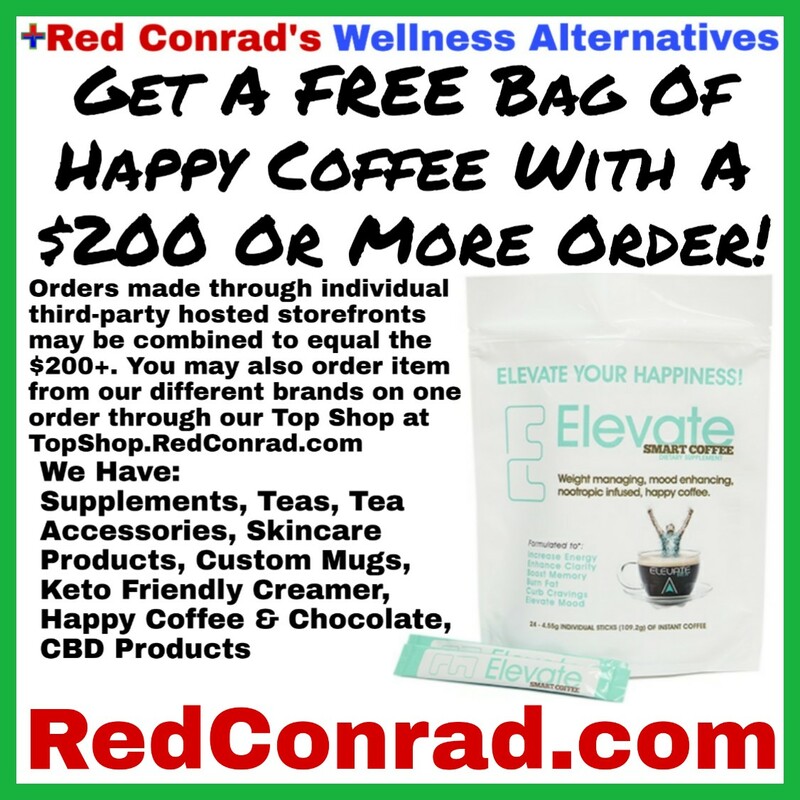 This coffee offers the benefits of caffeine, as well as the added benefits of stress relief, anxiety relief, and so much more; as well as promotes the healthy production of serotonin and endorphins. If you don’t drink tea or coffee, we also have a nootropic chocolate beverage available. It contains the same ingredients as the coffee (minus the coffee), same benefits as our coffee, but contains less caffeine. Click here to take a look at our coffee and chocolate and place an order. Next: Next post: The Amazing Health Benefits Of….Nicotine?